Today, at its annual Capital Markets Day event, Nokia revealed some details about it OS distribution strategies that we find particularly interesting. Apparently the company has finally realized two important things concerning its products. First, that the Maemo OS has great potential and second that their S40 feature phone UI is long outdated (at least in the midrange). So in the following years Nokia plans to reduce the amount of S40 devices that it releases and increase the percentage of smartphones in its portfolio. 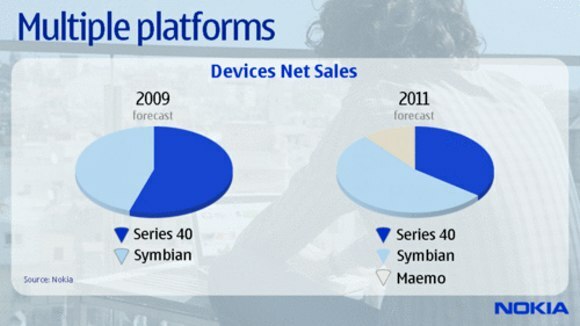 Both platforms currently utilized by the Finnish company (Symbian and Maemo) are planned to increase their share. The good news is that the not quite polished touch Symbian OS S60 5th edition should see a much sought-after update next year. We were actually hoping that S40 will be shown the door even faster than that (or at least treated to a total overhaul) but it's still some improvement and we appreciate it. Here are some other interesting points made by Nokia in their report. Nokia expects the amount of mobile phones sold in 2010 to be 10 percent higher, compared to 2009. The company expects to maintain its market share of 38% throughout the next year but admits that the average selling price of its devices will decrease.